Shop Classes and Volunteer Days are Back on Saturdays starting! Starting in February 2019, Tube Factory Artspace will be offering a 2 hour Shop Safety Training workshop. With the workshop you will be taught where the first aid and safety equipment is, rules of the shop, tool usage – both woodworking and metalworking, and get a tour of the shop. Come learn the basics of the tools in the Tube Factory Builder Shop! Get hands on training with woodworking and metal tools in an intensive 2 hour class designed to get you prepared to use tools safely in a friendly welcoming environment. The Tube Factory Toolshop is Big Car’s wood shop and studio located in the lower level of the Tube Factory artspace. It serves as our space for fabrication needs as well as a space for providing shop classes, other print and trade workshops, and space for community to build. 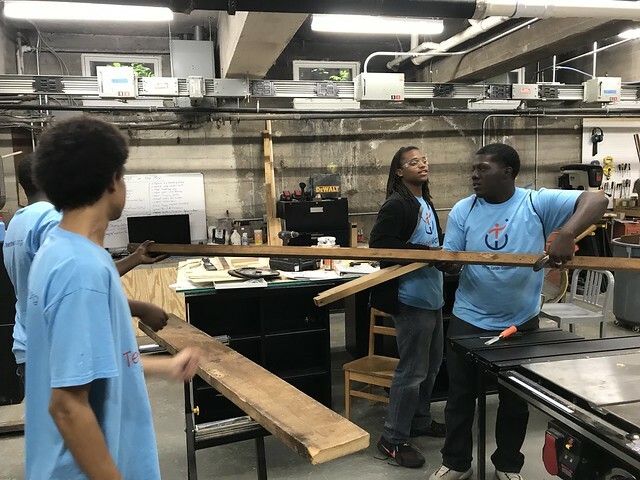 We work with young people – primarily TeenWorks, Christel House Academy, and Herron High School – to build both physical objects and important skills with individuals. We’re excited to announce the start of Big Car Builder Saturdays. Shop Safety classes will be held the first Saturday of each month with other Saturdays dedicated to shop education through project volunteering. The last Saturday will have an open meeting to create designs and plans for the next month and get input from the community on future programming. Safety classes have limited slots and include a fee that can be reduced or waived based on need. See photos and video clips of our work in the shop here. We always welcome donations of new and good used tools to the library and shop. Volunteers are welcome to sign up to help as we work on further renovations to the shop. Builder Volunteer days happen all other Saturdays also in 2 hour sessions from 11AM-1PM and 2PM-4PM. These sessions are only available to participants who have completed the safety course. The Last session of every month is an open meeting to discuss upcoming projects, work on designs, and get feedback. Everyone is welcome! Sign up for Shop Hours HERE! Once we are open again, people who have passed safety classes and have logged volunteer exchange hours can work during the shop’s open hours.